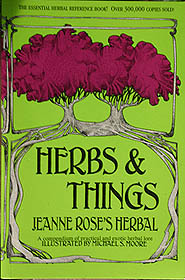 Just like the front of the book suggests, this book really gets to the ‘root’ of the topic at hand, herbs and things. If anyone understands this subject, it’s Jeanne Rose, herbalist and aromatherapist extraordinaire. This lime green book will become one that you will refer to often for it’s endless insight and fabulous recipes. The book starts off with human conditions (everything from Obesity to Preventing Nightmares) and what botanicals can be used to treat them. Then you’ll find a most thorough glossary of terms. You’ll also find weights and measurements, directions for using botanicals, and even a state-by-state buying guide of where to buy your herbs and supplies. Ms. Rose is a big believer in the art of the bath, and has added a most wonderful section on bathing in Chapter IX “Herbal Baths for Beauty and Health”. In the chapter she says, “Keep several bottles of different kinds of herbs around for different kinds of experiences – pine if you would like to fantasize bathing in a forest; a combination of rosemary and lavender if the scent near the ocean is what you prefer; jasmine if you like the feel of a warm tropical evening. They smell beautiful and perform the important function of smoothing and hydrating the skin, leaving it looking and feeling younger.” The chapter then goes on to include many inspirational bath recipes, including one from as early as 1606. The book continues on to natural methods of beauty care using herbs and other botanicals, with many more easy-to-use recipes including creams and lotions, cleansers, powders, masks, deodorants, astringents, hair shampoos, oils and aromatic vinegars, colognes, and even handmade soap. But the information doesn’t stop there. There are also ‘Female Recipes’, a chapter on ‘Fat and How Not to Be’, and a very interesting chapter all about common ailments, which includes many helpful recipes. Not to miss anything, the book ends by teaching some herbal magic and folklore. I know that this will be a beneficial book for you. If you enjoy making your own herbal beauty products, or are a beginner and want to learn more, you will not go wrong with this book. And don’t forget that Jeanne Rose travels the country teaching seminars, so make sure to check out her class schedule to see if she’ll be teaching a class near you. She also offers two wonderful at-home learning courses, the Herbal Studies Course and the Aromatherapy Studies Course.